The Poodle diet contains borage oil to enhance the condition of the breed's coat, with omega fatty acids 3 and 6 to relieve skin complaints and irritation. The food also combines a beneficial blend of vitamins and antioxidants to support the health of eyes; these include Lutein, Zeaxanthine and vitamins C and E. The specially formulated kibble incorporates a layered texture to promote chewing and maintain good oral health. Please visit our Breed Facts and Information for the Poodle. Complete feed for dogs - Specially for adult and mature Poodles - Over 10 months old. Healthy Ageing Support - This formula supplies a selection of nutrients to help maintain health in mature dogs. Muscle Tone - This formula helps maintain the Poodle’s muscle tone. Exclusive Kibble - Dental Health formula helps reduce tartar formation thanks to calcium chelators. Nutritional additives: Vitamin A:29500 IU, Vitamin D3: 800 IU, E1 (Iron): 44 mg, E2(Iodine): 4.4 mg, E4 (Copper):9 mg, E5 (Manganese): 58 mg, E6 (Zinc): 173 mg, E8 (Selenium): 0.1 mg -Technological additives: Pentasodium triphosphate: 3.5 g - Preservatives - Antioxidants. Protein: 30% - Fat content: 19% - Crude ash: 5.3% - Crude fibres: 2% - Per kg: Omega 3 fatty acids: 7.5 g including EPA & DHA: 3 g. *L.I.P. : protein selected for its very high assimilation. The following table show the recommended daily feeding quantities (grams per day). Fresh water should be available at all times. 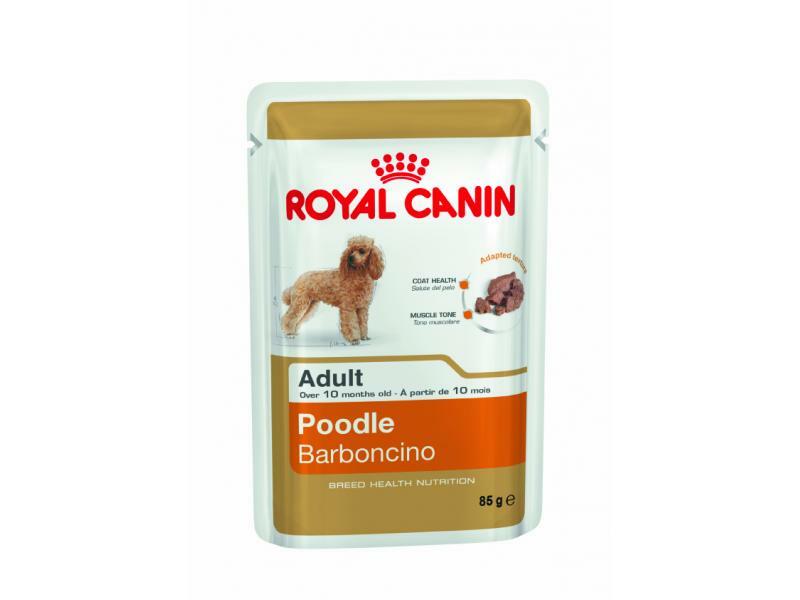 Contains nutrients which help maintain health of the Poodle’s woolly coat. Helps maintain the Poodle's muscle tone. Helps stimulate the Poodle's appetite. meat and animal derivatives, fish and fish derivatives, derivatives of vegetable origin, cereals, minerals, oils and fats, various sugars. Vitamin D3: 115 IU, E1 (Iron): 29 mg, E2 (Iodine): 0.19 mg, E4 (Copper): 1.5 mg, E5 (Manganese): 9 mg, E6 (Zinc): 90 mg. Protein: 9% - Fat content: 5.8% - Crude ash: 1.8% - Crude fibres: 1.1% - Moisture: 78.5%. There are currently no questions for Royal Canin Breed Health Nutrition Poodle Adult Dog Food - be the first to ask one!